There are a lot of people out there who want help whitening their teeth because they are too yellow. 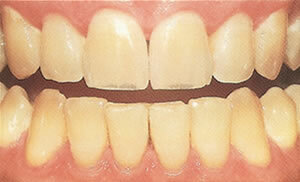 It is easy to feel self-conscious about your smile when your teeth have dark yellow stains on them. There are numerous methods out there to help whiten your teeth thanks to cosmetic dentistry. However, most people can't afford the cost of these medical teeth bleaching procedures that can run up to $650. Sometimes your teeth will get stained again right after getting treatment done. This is why home remedies for teeth whitening is a much more attractive alternative to many people. Why spend hundreds of dollars on expensive treatments that only provide you with temporary solutions when you can take care of the problem using items you most likely already have in your kitchen? Some of the things that cause your teeth to stain include aging, diet, smoking, drug abuse, grinding, or some type of injury. Most people don't know that their age plays a huge role in their tooth color. As you get older your teeth will begin to build up stains that will be tougher to remove. Yellow stains are much easier to remove from your teeth when you are in your twenties compared to when you are in your fifties. Keep certain stuff out of your daily diet if you want to avoid teeth stains. Food items like coffee, wine, sodas, and even oranges can cause major staining over time. Also read Foods for your teeth - some that delight and some that damage. That's right, believe it or not but olive oil has the necessary ingredients to eliminate stains on your teeth. The popular oil can be used to whiten your teeth once you are done brushing your teeth. Olive oil will also help get rid of any bacteria left behind from brushing along with whitening your teeth. To use olive oil simply soak a cotton ball in the oil and then apply it to your teeth and gums. If you rub the olive oil on your teeth longer it will be more effective. Try to use this olive oil treatment at night so you avoid wiping off the oil from eating or drinking during the day. Another way to use olive oil is through a method known as oil pulling in the morning when you wake up. You will need a tablespoon of olive oil for this home remedy to work. Put the tablespoon of olive oil in your mouth and gargle it for around twenty minutes before spitting out and rinsing with warm water. This oil pulling method will help remove toxins from your gums and mouth while whitening your teeth too. Orange peels are a great home remedy for teeth whitening because of the white part within the orange peel that contains plenty of beneficial compounds for your teeth. An orange itself can cause tooth stains because of the citric acid it contains, but the orange peels aren't acidic at all. To use orange peels you will need to peel the orange and then rub the white portion on the inside of the peel over your teeth. Once you're done start rinsing your mouth out with water and then repeat this procedure how many times you need to with a new piece of orange peel. Miswak is a popular home remedy for teeth whitening because it contains ingredients like chloride, potassium, and calcium that strengthen the tooth enamel. It contains exceptional antibiotics that will stop the growth of bacteria and plaque. The miswak is a teeth cleaning twig made from the Salvadora persica tree. This root can stop gum disease from developing, minimize tooth decay, help bad breath, clean between teeth, and whiten teeth. To use this home remedy you will need to find a local store to purchase it. Once you have the miswak take it out the package and bite the bark off at one end. Now chew on the end that is exposed until it turns into bristles. Now head to your sink and brush your teeth without any toothpaste. When you are done your mouth will feel refreshed and have a nice fragrance. That is all you have to do, and when you notice that your bristles are getting old just cut off the exposed bristles and start a brand new one. If you find it difficult to get a miswak twig, you may try a Miswak toothpaste such as this one. It does leave a fresh feeling after brushing. Make your own homemade toothpaste to remove stains on your teeth with a few simple ingredients. All you need is a little salt and baking soda to make this home remedy work. You will need to get two thirds a cup of baking soda and four tablespoons of sea salt together. You don't really need the sea salt for this recipe if you don't have it. You can just as well use regular table or kosher salt. However, the sea salt will increase the homemade toothpaste's scrubbing strength to remove stains. To make all you have to do is add the baking soda and salt to bowl and combine well. Now just add some water until you notice the paste is as thick as you want it. You can add a little peppermint extract to it to make it taste better and more refreshing. If you are looking for a natural way to whiten your teeth these 4 home remedies are some of the best choices you have. Give one of them a try and remember to always brush your teeth so you can keep your teeth pearly white. Author John Maddox is an experienced writer focused on learning natural alternatives for the most common health problems. I heard that if you brush your teeth with strawberries or bananas it would temporarily whiten them. But you would have to do it every day to get them to stay that way. Just squish a couple strawberries in a bowl, drink it, swish it around in your mouth for 3-5 mintues and voila! Whiter teeth!